Any automated client pull systems, such as web monitoring systems, Web services, or RSS systems, require resources that publish relevant information. These resources may be discovered manually, but this is not ideal. Public search engines may be used to find these resources by submitting appropriate queries. 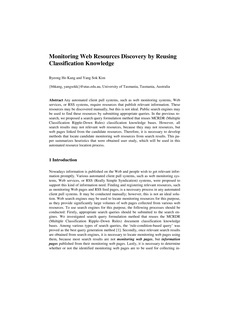 In the previous re- search, we proposed a search query formulation method that reuses MCRDR (Multiple Classification Ripple-Down Rules) classification knowledge bases. However, all search results may not relevant web resources, because they may not resources, but web pages linked from the candidate resources. Therefore, it is necessary to develop methods that locate candidate monitoring web resources from search results. This pa- per summarizes heuristics that were obtained user study, which will be used in this automated resource location process.